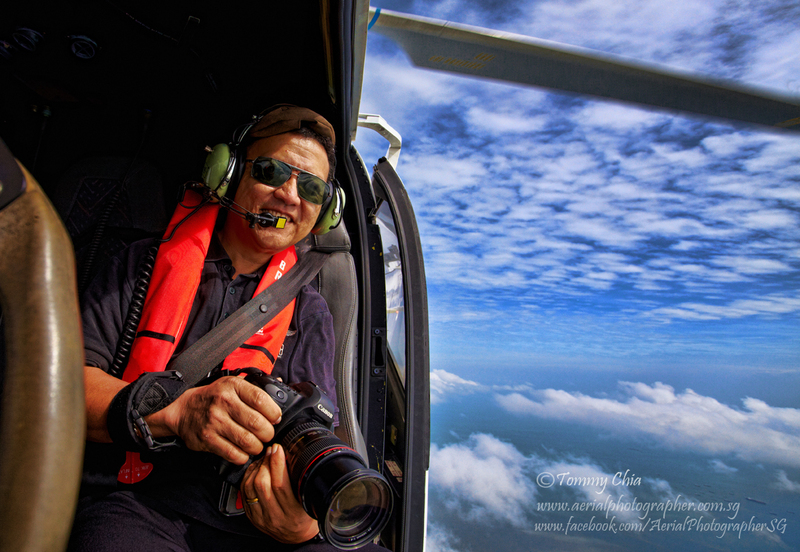 19th December 2013, Singapore – In our previous article (Part 2), we asked Master Photographer Tommy Chia to share with our readers on his job, his experiences and his area of work as an Aerial Photographer. As a professional photographer myself, I would like to share that his job is not for anyone. 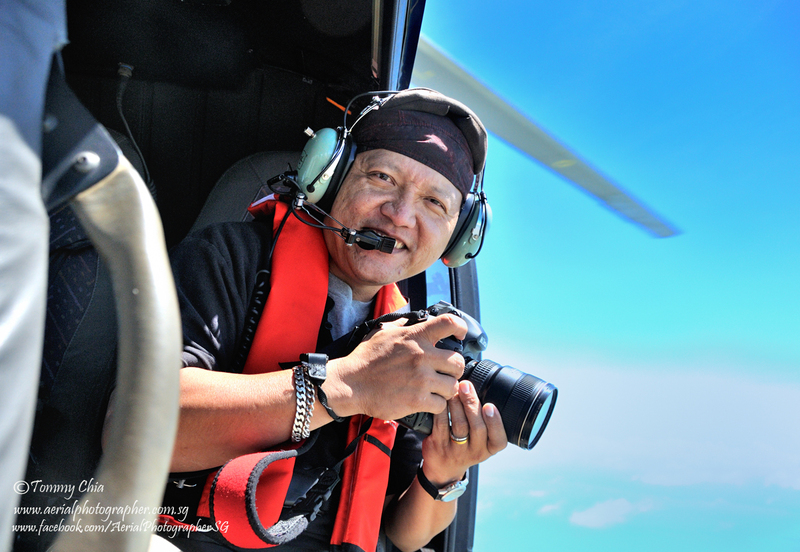 Aspiring photographers who wish to enter aerial photography must know what are the risks involved and it is not anything easy or simple. If you think shooting a wedding is complicated, aerial photography is easily 10 times more complex. 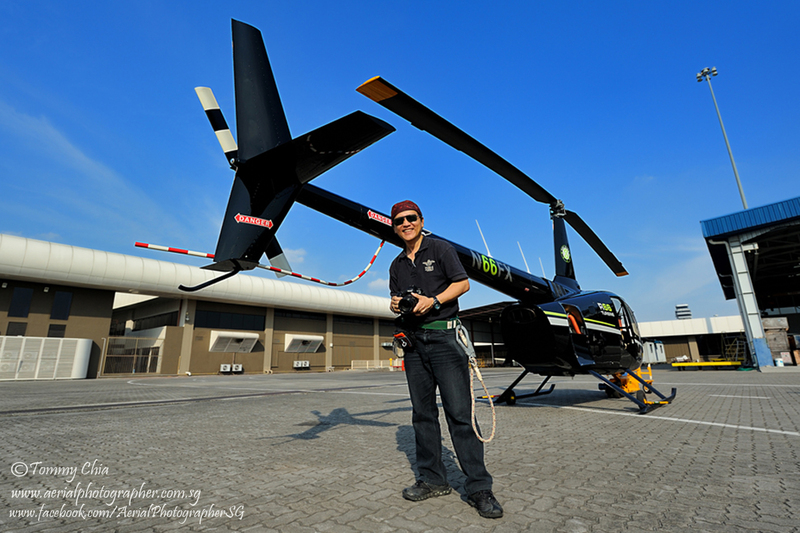 Aerial photography is a very specialized area of work whereby the photographer will need more than just photography skills. This is Part 3 & the final episode of this Special Feature Series. This is in fact the biggest Feature of 2013 by our site for a single photographer. In this part, we chatted with Tommy on his viewpoints, his perceptions and as expected, we were very inspired by his sharing. We hope you will too. Editor: There are rare experiences that have the ability to evoke our emotions and draw curiosity from our minds. Share with us some of the challenges faced by you in attempting to capture these rare experiences. Tommy: I’ve always seen things (objects, scenery, people, etc.) differently from others and I tend to forget that this is what differentiates me. But when I’m out on a shoot, I always look for that wow factor and I seldom fail when on assignment. Editor: As a photographer, there are some things that might seem strange to others but caught your eye nonetheless. What do you usually do to explore this “lead” and deem whether it’s worthy of a photograph shot? Tommy: At this moment most of my time is focused on my aerial work and I do not have much time for casual photography. But throughout the years, I’ve been accustomed to walking around with “a viewfinder stuck to my eye” so said because I look at things like what I would be seeing through the lens. I tend to pre-crop scenes in my mind and just enjoy the bits of excitement I find there. Most of the time now, I carry a camera wherever I go and I would snap at every opportunity I could. I would not want to miss any little detail of my surroundings as everything I captured never fails to fascinate me again & again. It is even more so now that it is the digital age, cameras are able to produce even more wonders, which actually does leave me with hundreds or thousands of images stored in my hard disc to be revisited again. (haha) In recent years, I am very much involved with our church outreach work in Cambodia and the Philippines, giving me a chance to continue enjoying photographing the people, their lifestyle and their habitat. Editor: In your journey as a photographer, as in life, we are sure you have faced both victories and setbacks. With regards to setbacks, do you think perception plays a key role in how we handle them? Describe a particular incident. Tommy: There was the first financial crisis in the 80’s and then I barely survived the global financial crisis of 90’s, which was followed closely by the 2000 financial crunch. I’d thought I had everything in the 90’s, what with the booming wedding business and a big staff strength of 16; but I almost lost everything for being too wrapped up in my own business. Should I have had the sense to think about the factors around me, I should have known what I learnt now, that every factor counts. I.e. how small Singapore’s economy is and how easily it gets affected by other countries. How these factors would in turn affect our own environment, costing people their jobs during the financial crisis and thus budgets. “If only” I had seen that coming, the phrase every man would learn from losing something. Had I dwelt in my misery and loss of self-confidence, I do not think I would be who I am today. Therefore it is true to me that perception is important, and especially what a person learns from his setbacks. Although I paid the highest price for learning to run a business, but it is also from this that I learnt why humbleness is important. Editor: It’s a fascinating world we live in. Sadly, many of us get too caught up in our lives to even notice the details that encompass our surroundings. Just how inquisitive are you as an individual? Do you let things slip by or do you have a natural curious eye? Tell us more about it. Tommy: I am very curious about the world we live in. I would love to travel and capture things that I’ve see. I wish I had have more time to travel but due to family and work I am not able to travel to places too far. Fortunately my present works take me to neighbouring countries and the chance to fly. Once a year for a few days, I make time to visit Cambodia and the Philippines to support our church work there and help the people. Recently I bought a Samsung NX300 an APS-C camera and have been carrying it around where ever I go, I get to use it when I see an interesting subject. Editor: Looking at the world through the lens versus through the naked eye. How do they differ? Would you feel more inclined to be curious about a certain subject if your intention was to photograph it versus just a passer-by’s observation? Tommy: Because I’ve been in photography for a major part of my life, I have a build-in view finder which I mentioned earlier. Everything I see through the naked eye is as if through the lens. I guess I’ve forgotten what’s it like to see things ‘normally’. Or as my wife sometimes reminds me, she’d tell me to stop staring at things. Editor: I can understand how that feels, Usually my wife ask me to stop staring when I am staring at ladies passing-by (haha). And, When you shoot a subject, do you intend for it to tell a particular story, or do you leave that up to the viewer to interpret? Tommy: Photographers are light painters. As a painter and artist I always capture my pictures so that they tell a story, a story as interpreted by me. But there are also times when people see my pictures and add on their own versions to that story. It is fun at the same time. Editor: That makes sense. Have you ever gotten feedback from a viewer about how your photographs have affected them in a special way? If yes, please elaborate. 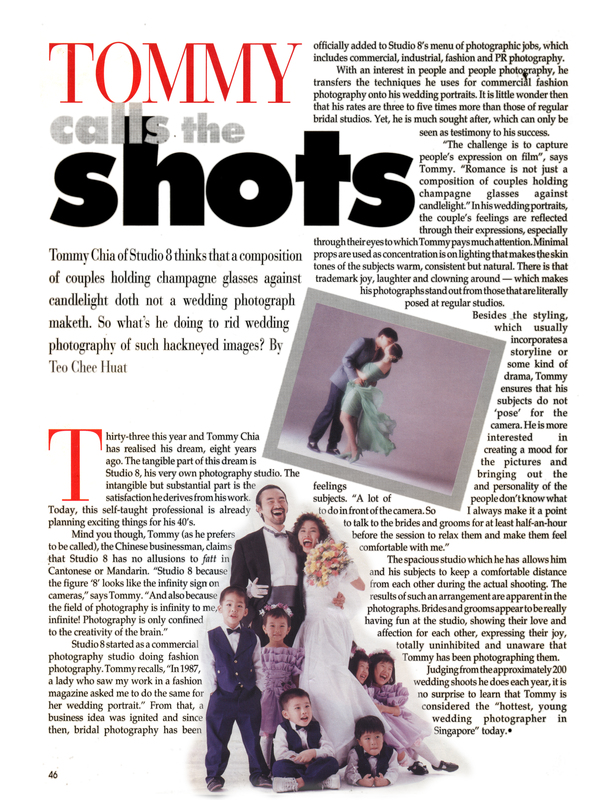 Tommy: My lifestyle wedding pictures were based on my perceptions and my understanding of the wedding couples. I drew out their characters and personality in their expressions thus making their wedding pictures more personalised and intimate as we can almost see them bearing their soul and love for each other. So even though I’ve focused mainly on aerial now, I still get calls from past wedding couples and they’d remember me on chance meetings on the streets and our conversations would always be to reminiscence on the photos; testimonies on the delightful memories I had help to capture. Editor: Do you feel that a photograph, no matter how simple, has the potential to draw a viewer in emotionally? Tommy: Photographers are like time stopper, we capture that moment in time. New ships start rusting the moment they launch into the sea and it will not look the same again. Wedding couples progress in their lives to have families and they introduce me to their children as the uncle who took their happy wedding pictures. So these pictures taken through time, will always allow someone to look back at it and reminiscence. Like now when my past wedding couples and their children come to me to have their family portraits taken, they’d say this was the uncle who took their wedding pictures. At the same time, I have the privilege of meeting my past wedding couple’s children, capturing their pictures when they were children, and now, they’re in their 20’s. From my visits to Cambodia and the Philippines, I have also come to love taking pictures of the poor children and streets kids as they very fun and adorable. I would capture these moments with a fast tele lens, isolating the subject from the background, to make as if that ‘time’ was captured right there and then. Editor: Are there any techniques that you use to draw yourself closer to viewers, i.e black & white/sepia/bokeh photography? Tommy: I am an old school photographer. For portrait, I still advocate fast tele lenses by isolating the subject from the background. Watch out for the objects, colour and reflections behind for they may still be an eye sore for critiques like me. Pay attention to the focus point (usually the eye) and to expressions because that is what is going to stand out. For landscape, I like to do a very light HDR. To achieved a light HDR effect I usually layer the 2 similar images (one with HDR effect added) and adjust the opacity to the desired lighter tone. Editor: What equipment do you shoot with? Share with us what your favourite gears are and in what instances you use them. Tommy: For daily walkabout, I carry the Samsung NX300 with 3 lenses. Being an APS-C, the images captured are sharp and it is very light and portable in a small bag. For my professional work, I use 2 Canon 5D Mk3 with battery grips, lenses are 24-70 f2.8, 17-40 f4 and 70-200 f2.8, my 3 usual suspects. Also have with me the 100mm macro for close-up shots. As my work subjects are huge, short tele and wide angles are my favourite choices. Editor: That’s quite an asernal of gears. In the course of your photography journey, tell us about your discovery of new shooting locations? Tommy: My work has taken me to many places. For me, Cambodia’s temples and streets are great places to shoot, Philippines’s beaches are good for recreations with awesome scenes for sunrise, sunset and blue skies. As in any travel, personal safety is paramount and so is being considerate for the country’s culture and beliefs. Editor: Do you always know what you are going to shoot, or do you experiment a lot? Like the type of vessels, how they looked like, what are they used for, etc. Tommy; No more experiment at my stage of work. As mentioned earlier, I would have known the type, size, speed and even the colour of the vessel so as to guide the pilot and let him know the height and angle at which to fly. As I’ve been working with most of them regularly, there is a special bond between us allowing me to grab the shots that I want. Editor: What elements in your photography do you feel appeal most to people? How do you keep them captivated, wanting to see more from you? 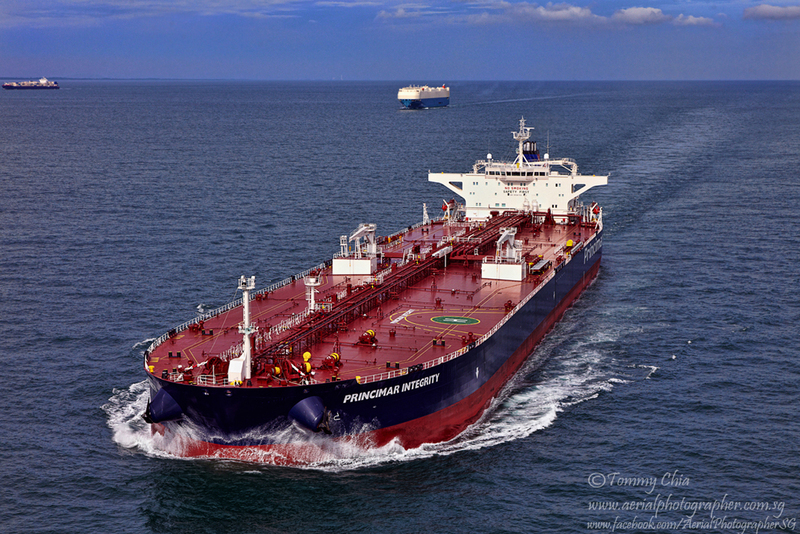 Tommy: A lot of my clients have said that the ships I shot look very fierce, strong and exciting to look at. I guess the years of shooting has created a style that come from the feel of that high sea chase moment. Editor: In your opinion, what differentiates a great photo from one that is just visually appealing? Tommy: A photographer who shoots with passion will be reflected in his work. Because he will take the extra step, raise the extra height, make the extra turn and go the extra distance just to capture that moment. He will definitely create the extra smiles and appreciation as compared to a picture that looks just visually pleasant. A sort of ‘life’ will be in the photo you capture, and also tell the story the photographer wants to say. Editor: Do you have any types of photography/project that you plan or want to do but not done yet? Tommy: Maybe a personal exhibition and to catch the Northern lights with my camera. Editor: Any advice for budding photographers? Tommy: Passion has kept me alive. Do not always follow what others are doing, creativity is non-conformist. It is OK to make mistake(s) when you are young but learn from it. For Jesus believers, if you run out of power and fill like giving up, Start Praying. That is tapping into God’s power, let go and let God be in control and that was what I did. Editor: Thank You Master Tommy. We have come to the end of the biggest Feature series of 2013. 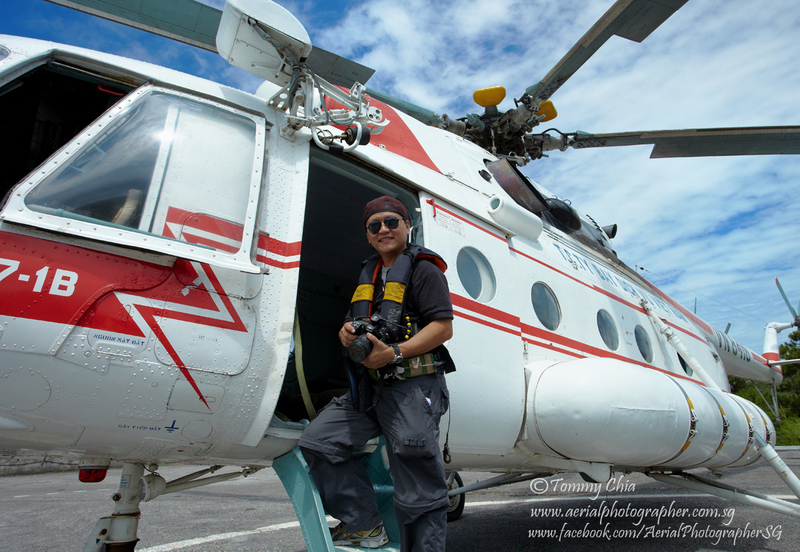 Special Thanks to Master Photographer Tommy Chia for taking time out of his busy schedule and opening up his life for all the readers here. I am sure, many of you will be as inspired as me after learning about what Tommy has went through at the various point of his life. Although bitter-sweet, through his preserverence, he is now a “houshold name” in the area of professional aerial photography. Thank you Master Tommy Chia. We wish you all the very bests and thank you for granting us the opportunity to bring your story to our readers and allowing us to document your life experiences into a good reference for many others. This entry was posted in Featured Photographers, Photography Articles & Videos, Uncategorized and tagged Aerial Photographer, Aerial Photography, Featured Photographer, Tommy Chia. Bookmark the permalink.